Mandy Pannett has spent many years teaching English to pupils with a wide range of abilities including special needs as well as leading creative writing workshops for children and adults in various parts of the country. 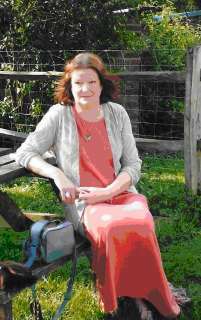 She runs an Arts Café in East Sussex and is involved in working with local writing groups, advising on, and leading, many sessions on poetry appreciation and writing. Review of ‘Allotments in the Orbital’ ‘What I like most about Mandy Pannett’s poetry is the way she sees the small things of her world within a wider orbit. It is there in her title. In her alloted plot of place and time, with its common slugs and flower pots, she takes as her context the geography, history, myth and art of ‘Albion’ and beyond Corregio ‘in the Greenhouse’ while ‘Titian skies’ move overhead. She is, as she declares, ‘layered with many personae’ through which she speaks or is spoken through. Other ‘levels and layers’ are constantly revealing themselves within the everyday of her life. ‘Three steps exactly to the nearest ghost.’ ‘Ghost’ is her favourite word, it seems. Though sometimes haunted by painful memories and presences, this poetry is wide open to allow the guardian spirits of Chaucer and Malory and others to move through its syllables. Mandy takes her work as a poet seriously, knowing that she is creating within the living stream of a tradition, a community of language that she is responsible to as she writes. She is also, by the way, most generous in her encouragement of others within the orbit of our present poetry. Paul Matthews 18 Nov 2009. This is a special edition of Transparent Words and I have the great pleasure of being able to publish a complete work by Mandy Pannett, THE CARVER’S MARK, together with other poems on a similar theme all of these poems are accompanied by pictures supporting the poems. There is little point in saying more as the poems and the pictures all do an excellent job of speaking for themselves. too busy just to call…. or laugh it off and say Not that again! The pain of growing to a pearl has left me dry. © The Copyright for any original work appearing on this web site remains with the respective authors.